On 18 April 1968, the London bridge built in 1831, was sold to the American entrepreneur Robert McCulloch for US$2,460,000. Why was the old London Bridge sold? In 1962 the bridge was found to be in disrepair and sinking into the Thames due to the increased traffic. It needed to be replace. Where is the old London Bridge now? The ols London Bridge which spanned the River Thames for almost 140 years, from the 1830's until 1968, was moved moved 7,000 miles to Lake Havasu City, USA, as a tourist attraction. There has been many London Bridges - each one either falling down or having to b replaced due to not being fit for purpose. The first London Bridge is thought to have been built by the Romans sometime in the first century. The first few London Bridges were wooden bridges, these were eventualy replaced with a stone bridge, the first one being started in 1176. 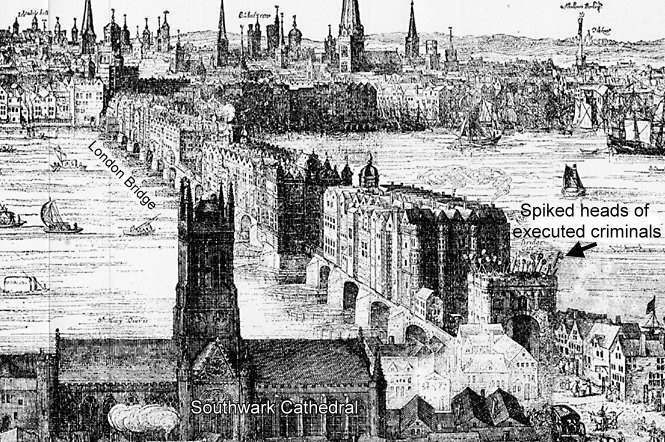 Throughout its history, London bridge has been a busy thoroughfare, and was once lined with shops. The road over the bridge was only about 4m wide between the shops. It was so narrow it often jammed with people, horses and carts. An engraving by Claes Van Visscher showing Old London Bridge in 1616. In 1757 the houses and shops on the bridge were demolished. A new bridge was built in 1831 to replace the old one. The present london bridge opened in 1973.